With an alarming increase in heroin overdoses, Narconon Freedom Center has issued a warning to loved ones regarding fentanyl-laced heroin and its dangerous effects, in an effort to end the stigma of drug addiction and help more addicts receive the help they need. Narconon Freedom Center staff speaking with clients on the program. With such a lethal drug being laced in today's heroin, we at Narconon Freedom Center truly are concerned and want to help as many addicts as possible recover from addiction. Narconon Freedom Center is urgently warning anyone that is struggling with heroin addiction or knows someone struggling to seek help immediately. A large amount of the current heroin being sold across the United States is being laced with fentanyl making it 100 times more potent and lethal. Heroin can be found as black tar or off-white powder, but when laced with fentanyl the drug looks exactly the same, which means you do not know if you are potentially getting a lethal dose of heroin laced with fentanyl or not. There have been cities reporting twenty-four or more overdose deaths in a single day, along with Chicago reporting seventy-four overdoses in seventy-two hours back in October. This steep increase in overdose deaths is due to the lethal combination of the drugs and is tearing entire communities apart. The current outbreak has put law enforcement and government agencies on high alert, as they witness an alarming increase in fentanyl related deaths across the country. Even more alarming is that it is not just first time users being effected, but everyone that uses the laced heroin is potentially at risk of an overdose or death. With the National Institute on Drug Abuse (NIDA) reporting an extraordinarily high increase of heroin overdoses over the past few years, the epidemic is only spreading into more homes each and every day. The total number of deaths from heroin skyrocketed to over 10,000 individuals in 2014 and continues to soar. Narconon Freedom Center is issuing this warning to not only warn individuals across the nation about the potentially lethal heroin, but to aid in ending the stigma of addiction. Together we can conquer addiction and educate our communities to assist in bringing light to addiction and rehabilitation. To help a love one struggling with heroin, call one of our addiction specialists today at 877-639-2909. 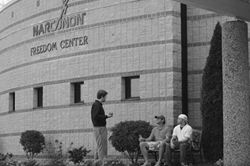 Narconon Freedom Center is a non-profit drug and alcohol rehabilitation program, which is located in Albion, Michigan. The program has been helping those struggling with addiction for nearly 50 years. As a holistic drug rehab, the program focuses on healing the mind, body and spirit. The drug and alcohol rehabilitation facility also provides drug prevention education to schools and community outreach programs.